Stärker Music @ Zhongshan Park | JACQSOWHAT: Food. Travel. Lifestyle. A Stärker Fresh Brew is one that stands out and unique from the others. Keeping to the German tradition of beer drinking, fresh beer is served in traditional wooden barrels imported from Europe. There are 5 unique brews - Lager, Dunkel, Charcoal, Aromatic and Lychee. The Lychee flavored one has been labelled by Stärker as Ladies' Favorite. And so, we had a 2L (S$61.90) Lychee fresh beer served straight from the barrel and is best consumed at 3°C. The smooth brew is fragrant with a slight hint of belgium lychee and our mugs are changed frequently to ensure coldness. What's a time of fresh beer without nibbles right? The extensive menu include bar snacks such as this Sweet Potato Fries w Salted Egg Sauce $12.80. Love the creamy and rich salted egg yolk sauce, wish there were more. Chilli Crab Sliders ($16.80 for 3), these petite buns is sandwiched with a huge soft shell crab then topped with lashings of chilli crab sauce. These small sliders are definitely packed with flavours. Who agrees that pork belly and beer makes a perfect pair? The signature Crispy Roasted Pork Belly $14.80 at Starker has tender layers of fats and meat, topped with golden crunchy crackling. It is then served with Sauerkraut and French mustard sauce on the side. I personally wish there were more 'porky juice' in them. Apart from bar bites, there is an array of international cuisine and mains as well. We had the Truffle Mushroom Risotto $20.80 which was a crowd pleaser, topped with Japanese wild mushroom together with black truffle paste and white truffle oil. Distinctive truffle fragrant adsorbed by the slow-cooked rice, comfort in every bite. We were highly recommended to try the Traditional Pork Knuckle $38.80 which could possibly feed up to almost 4 pax, served with Starker beer sauce, creamy mash and topped with onion rings. The home-made mashed potato makes a perfect complement to the pork knuckle that possessed a crispy outer skin. Overall, the meat was a little dry within. No doubt, Starker Music is a place for a night of cold beer, music and nibbles. 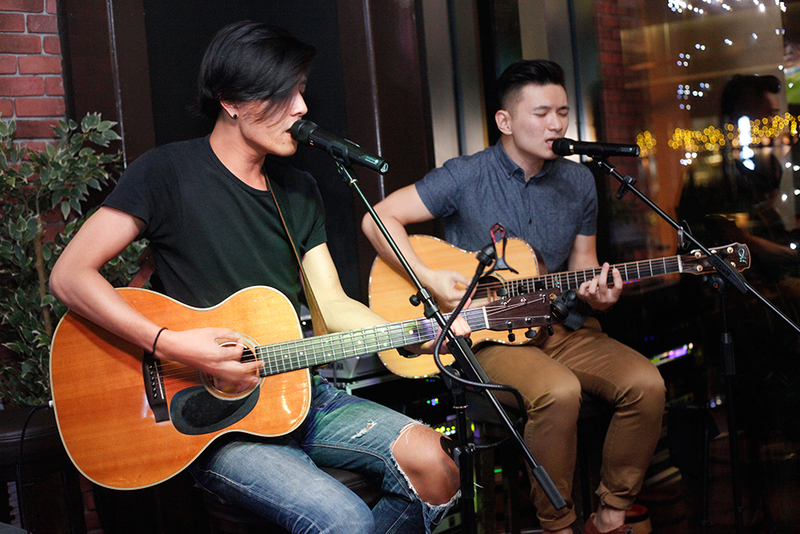 It is also a platform where musicians gather and mingle, as well as support local emerging talents. Situated in a centralized location, Starker Music makes an ideal spot to chill with friends, over fresh beers and music.